This beautiful, colorful, summer salad is rich in proteins and antioxidants as well as super satisfying in flavor and texture. I love salads and, in Northern California, we are blessed with such an abundance of produce, wild and cultivated alike that, often times, we see other dishes somehow being transformed into a really awesome, satisfying salad – Chinese Chicken Salad, Chopped BBQ Chicken Salad, Crispy Shrimp Salad, Pad Thai Salad, Chicken Bacon Ranch Salad, Grilled Watermelon Salad, Seafood Louie Salad, Filet Mignon Salad, salad wraps, lettuce wraps – we really do love our produce! And there really isn’t much we won’t put into a salad. 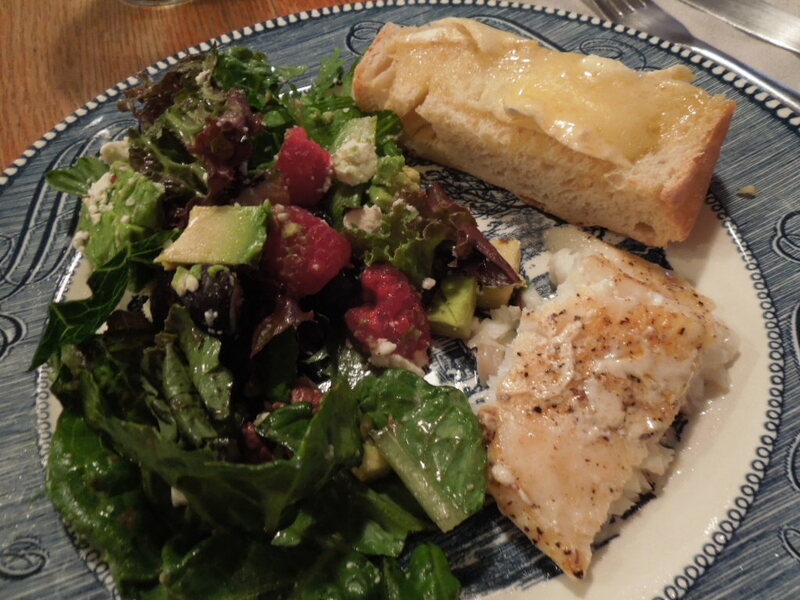 While this salad could be eaten as a whole satisfying meal all by itself, today I paired it with a little fresh grilled cod and some beautiful green onion slab from Acme Bakery, topped and toasted with some Mt. Tam brie from Cowgirl Creamery, both in the San Francisco Ferry Building (my absolute favorite place to shop for ingredients). *Optional step: Preheat oven to 400 degrees. Place pecans in a roasting pan and cook for a round 8 minutes, jostling pan to toss pecans a little from time to time. Do not over cook! They are done when you can smell them. Remove from oven and let cool in pan. 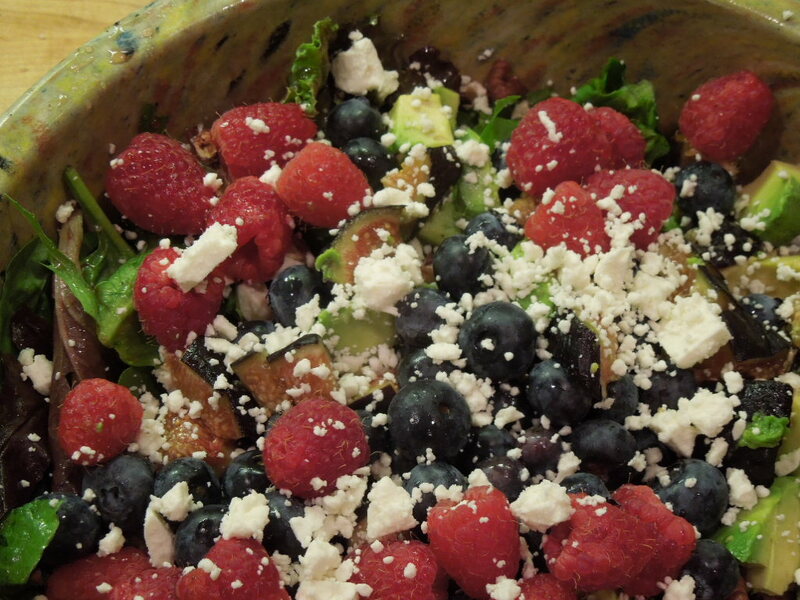 In a large bowl, toss greens with dressing and pepper to coat evenly and thoroughly. 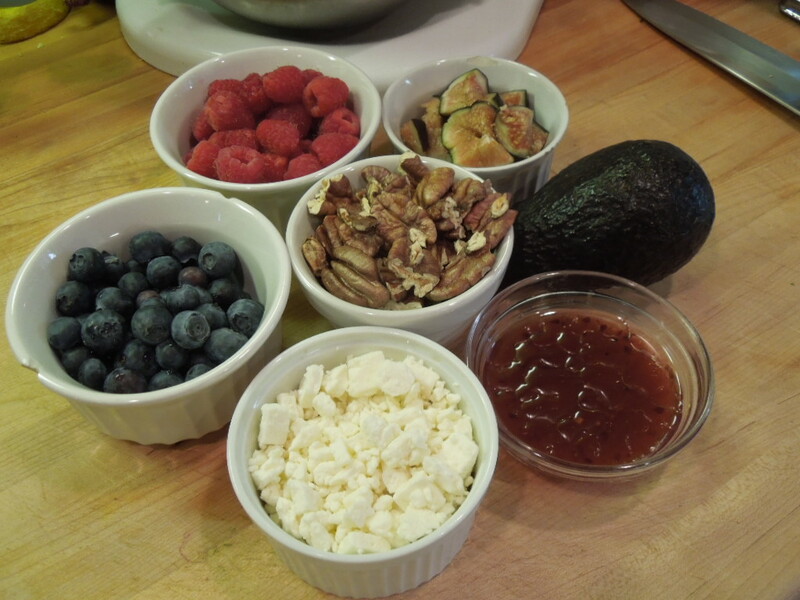 Top with diced figs, feta, blueberries, raspberries, avocado and pecans. Serve with tongs and a big smile. 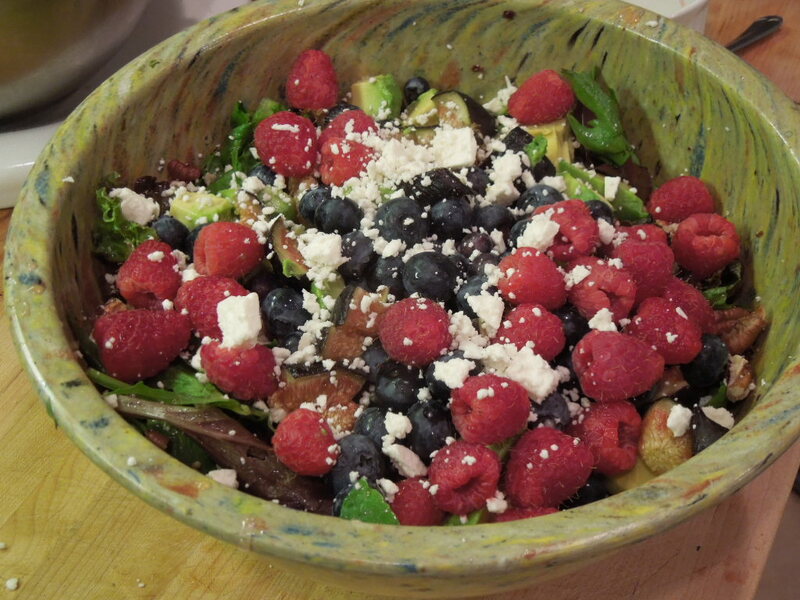 Tags: appetizers, avocado and fruit salad, feta and fruit salad, food, healthy salad, hearty salad, mixed green summer salad, recipes, salad with avocado, salad with berries, salad with feta, salad with fruit, salad with fruit and nuts, salad with peacans, salads, vegetarian dishes. Bookmark the permalink.